Don’t throw away that celery! Save the banana peels! Turn your kitchen scraps into rich fertilizer for your garden. 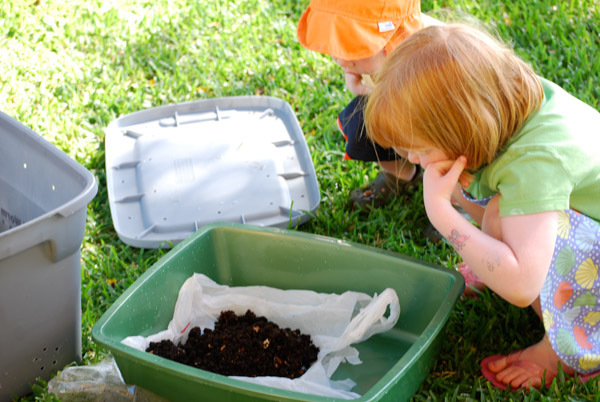 In honor of Earth Day, start a simple worm bin composting system. The whole family can participate, and it’s easy to keep up. Several years ago, when our garden was under way and we just started raising chickens, our gardener friend Dusty suggested we try composting with worms. I knew my kids would love it and we’d end up with rich vermicast (natural, organic worm poop fertilizer) for the garden, so we headed to the (now defunct) Waikiki Worms store to take a look. The kids got to go behind the scenes and see the composting system that used leftover food from Chef Mavro’s restaurant to create the clean, black vermicast. We learned how to create bedding for the worms by shredding newspaper and adding food scraps. We bought our first worm bin from Waikiki Worms, but once we saw how easy it was to make, we made our second one. Beloved Dusty brought a bag of worms over. Ewwww. Actually, cooool. Start with a small, handful of worms. Feed them about a handful of food each day and keep their bedding (shredded newspaper) damp. That’s it. Six months later, the worms will have turned your leftover food and newspaper into fertilizer for the garden. Our worm bin is located in the shade under our lanai that it easy to get to. 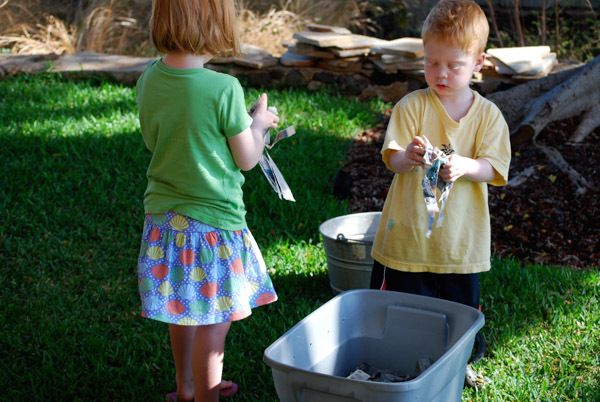 We found that the easiest way to remember to feed the worms is to do it routinely once every weekend. Throughout the week bag your scraps and freeze them. Be sure to let the scraps defrost before dumping them in the worm bin. Open the worm bin, move the top layer of shredded newspaper away, lay the food down, and cover it back up with newspaper, and adding more if needed. 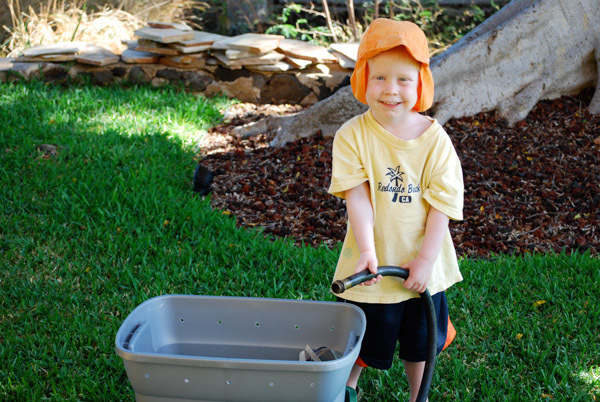 Drag the hose over and spray the newspaper thoroughly, until water trickles out the bottom. When it is really hot and dry outside, check the bin midweek to make sure it is not drying out. Keeping a layer of damp newspaper on top will keep flies away. If you have all kinds of bugs inside (no flies though), it means your bin is healthy. You should have no rat problem or smell. We’ve found that avocado skins do not decompose easily. We were told not to put papaya seeds in as they affect the fertility of the worms (our chickens get those). I also read to go easy on the citrus rinds. Our worms get fruits, veggies, breads, cereal, rice, but no protein. If you DO inadvertently put some in, you might find some Black Soldier Fly grubs inside. They won’t hurt anything, they just signal the presence of protein. 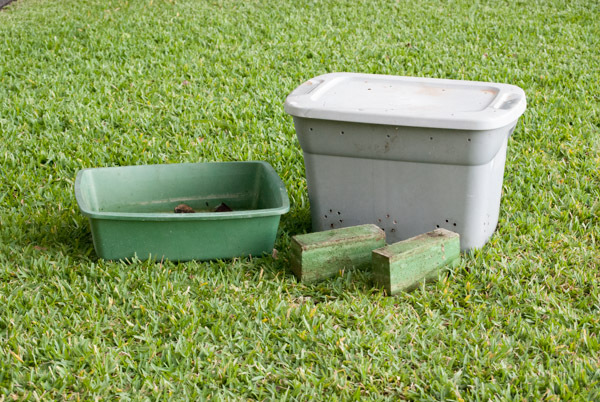 Approximately six months after setting your worm bin, you can harvest the vermicast. Spread a tarp on the ground. Have a new, clean supply of shredded newspaper ready. Open the worm bin. We usually have a layer of newspaper and uneaten food near the top that can be saved and put back in when the bin is clean. Dump the bin upside down on the tarp. Rinse it out and place the new bedding inside, along with the food and newspaper you just saved. The giant pile of vermicast on the tarp needs to be separated from the worms. Break it up gently and slowly so it is not compact. We all don gloves and gently spread the outer layer of vermicast away from the center. We collect all of the vermicast in another container. If we find a worm, we put him in the new bedding inside the clean bin. The majority of worms will shy away from the light and burrow down towards the center of your pile of vermicast. 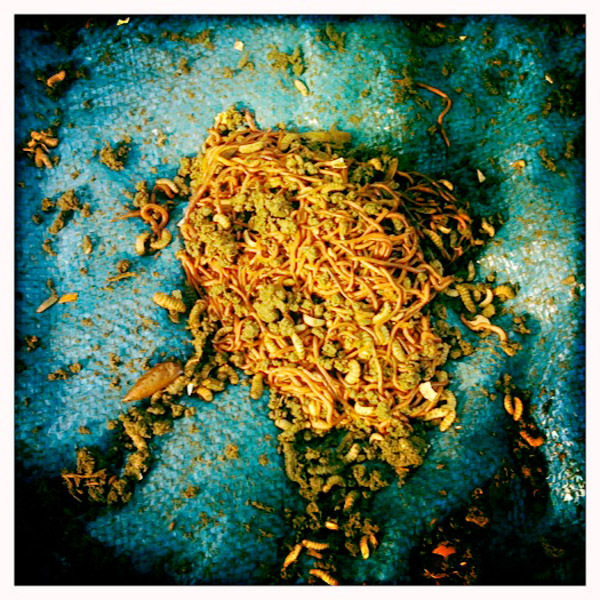 It takes at least 30 minutes to slowly sweep the vermicast away from the top and edges, leaving the pile smaller and smaller. The end result is really cool—a worm ball! 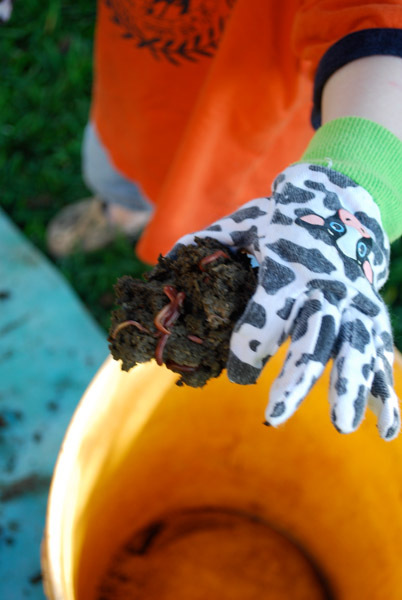 Well-fed, well-cared for worms will reproduce, so after a harvest or two you might have enough worms to start a second bin, or pay it forward and give them to a friend who wants to get started. Honolulu peeps, I have two bins that need to be cleaned, so if you want to help, I’ll be happy to give you some worms! * On Oahu, worms can be purchased at Kokua Worms (http://www.kokuaworms.com/) on Queen Street. 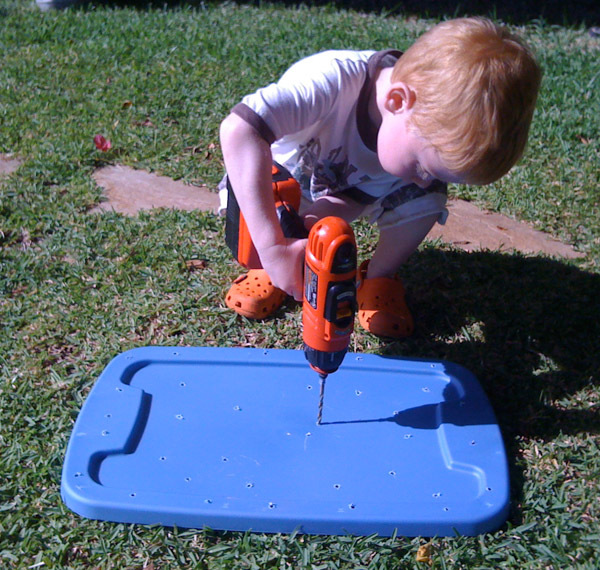 Drill holes all over the plastic storage bin and its lid. Don’t forget the top and the bottom. The holes will allow the excess water to drain and to let the air circulate. Place shredded newspaper on the bottom of the bin. Make sure it is several inches deep. Add another inch or two of shredded newspaper and wet it. Feed your worms the remnants of your fruits and veggies from the kitchen. They can also have bread and grain, but no protein. Make sure the bedding (newspaper) does not dry out. 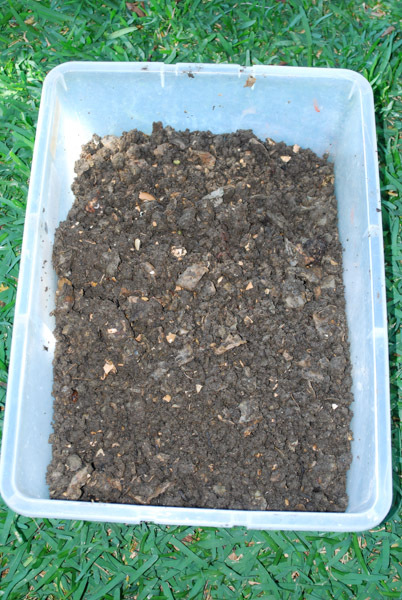 Plan on harvesting your vermicast around six months after you begin. 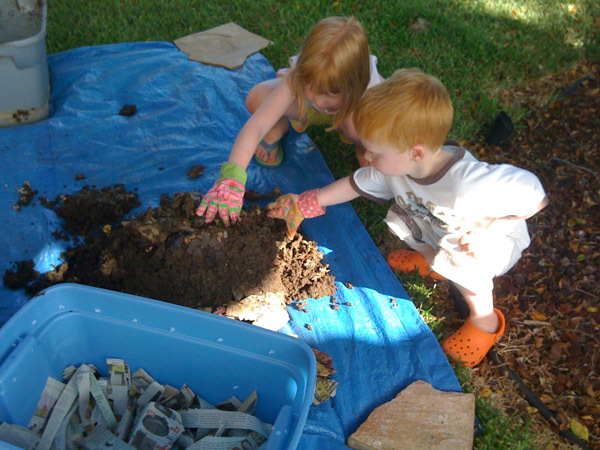 This entry was posted on April 22, 2013 by mdaucello in Il Gardino, Our Garden and tagged compost, Earth Day, fertilize, garden, vermicast, worm bin, worms.